July 8, 2014 by David Shields. Average Reading Time: about 8 minutes. 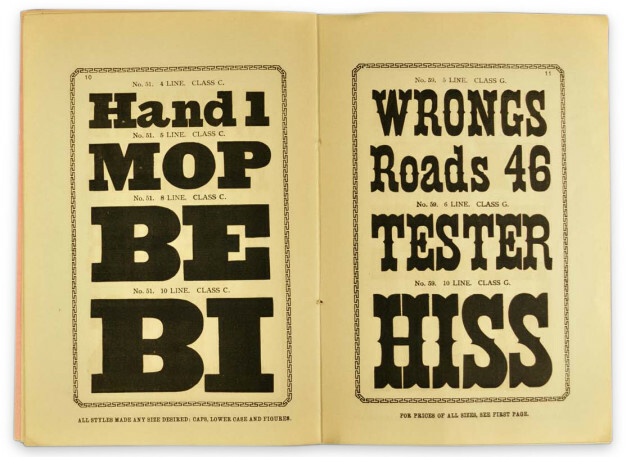 A previously unrecorded Hamilton & Katz catalog Specimens of Holly Wood Type, Borders, Reglets and Furniture was donated to the RIT Cary Graphic Arts Collection in March, 2014 by William Andrews of the Challenger Press in Brockport, New York. Before this new catalog came to light there were only two known and recorded Hamilton & Katz type specimen catalogs held in American archives. In the best of circumstances a specimen catalog will be printed with a clearly descernable date of publication, unfortunately this particular catalog carries no apparent imprinted date. A bit of deduction and inference is needed to uncover when a catalog was published. Fixing a specimen catalog’s publication date in vitally important in that it establishes a clear chronology for when the document was created and distributed. This work helps clarify when wood type and decorative material displayed in the catalog were first introduced, this in turn helps set milestones in the development of the history of typography and charting the evolution of visual culture. A number of methods can be used to help determine a date, or establish a date range, when a publication date is unknown or uncertain. Comparing an undated catalog to other known catalogs by the same company (or in certain instances to competitors’ catalogs) is a helpful tactic. This allows for examining differences in product offerings, type prices, type names or numbers, and catalog titles or series/edition numbers. Other useful clues to look for include company addresses, printing attributions and/or textual references in the front matter. There are two known and recorded Hamilton & Katz type specimen catalogs that can be used for comparison. 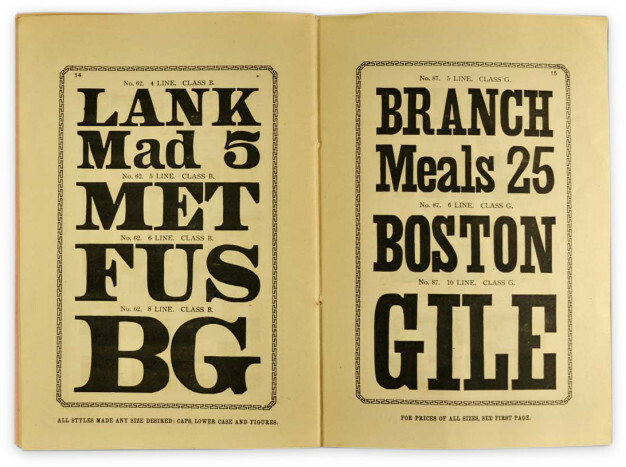 The earliest catalog is in the American Type Founders Library Collection at Columbia University which, while it has no printed date or edition number, is recorded as 1881–1883, with notes implying it was the first Hamilton catalog1. The second catalog is in the collection of the John M Wing Foundation on the History of Printing at the Newberry Library which carries an imprinted date of April 1, 1884 and text stating that it was the “Sixth Edition of Wood Type Specimens”2 presented by Hamilton & Katz. While the newly donated catalog in the Cary Collection has no explicit publication information, a date range can be established that narrows down the likely publication to between late 1884 and mid 1885. It is clear that this catalog was published sometime before Hamilton & Katz3 became Hamilton & Baker. On November 1, 1885, Maximilian Katz retired from the company and William B Baker of Springfield, Illinois purchased his interest to become J E Hamilton’s new business partner. It can also be established, though less clearly, that this catalog was published sometime after the “Sixth Edition” catalog which has an imprinted date of April 1, 1884. Though less definitive than the published before date, this date can primarily be inferred from comparing the type sizes offered on the price lists from the two catalogs. The new Cary specimen catalog lists prices for type as small as 3-line4 and has prices for type as large as 100-line in all of the price classes (Class A–Class G). In contrast the “Sixth Edition” catalog only lists type sizes as small as 4-line, and only offers one price class (Class A) in 100-line type. This clearly indicates progress in the company’s production capabilities. This inference is further reinforced by looking at subsequent specimen catalogs. The November, 1886 Hamilton & Baker catalog5 lists one price class at the yet smaller 2-line size and by the September, 1891 catalog6 of The Hamilton Mfg Co7, 2-line was offered in all price classes. All type and borders offered for sale in the new Cary catalog, though fewer in total number, are also present in the “Sixth Edition” catalog. The prices of the type for each size and class offered is the same in both the “Sixth Edition” catalog and the new Cary catalog. This could mean either that the catalogs were published close enough in time to each other that there were no pricing changes or could mean that there were simply fewer price fluctuations in the period of time separating the two catalogs. Without enough contrast in the data there is no basis for determining chronology. It should be noted that in the November, 1886 Hamilton & Baker catalog all of the prices for all type sizes and classes increased. This increase provides enough contrast in the data to clearly indicate a shift in chronology. Hamilton used a numbering system to differentiate type styles rather than assign names to type designs. Starting in the late 1880s, Hamilton type numbers were assigned sequentially and consistently, as a new face was designed and offered for sale it was given the next higher sequential number available. This system provides an effective method to date Hamilton types produced between the late 1880 and early 1960s. Unfortunately this systematic approach was not implemented at Hamiton until 1888. In the date range of the new Cary catalog, there is no relationship between the assigned type number and when the type was designed or first offered for sale. The new Cary catalog does not indicate a series/edition number. This fact renders the use of the edition number indicated in the text of the “Sixth Edition” catalog unreliable as a means to provide a chronology for the new Cary catalog. No Hamilton catalog yet found from before the “Sixth Edition” catalog indicates an edition number and not until Catalog No 13 from 1896 is an edition number used again by Hamilton. Another possible clue that might have helped date the new Cary catalog is the printing credit on the front cover: Tucker & Co — La Crosse, Wisconsin. N P Tucker established his printing business in 1881 and the name was used until September, 1886 when the shop was purchased by his employees and the company name was changed. Curiously Newton Tucker seems to have vanished into thin air sometime early in 1886. This mystery is chronicled in the March, 2013 post at Lasting Impressions. While this is interesting information—and a colorful story—the fact that the name “Tucker & Co” was only in use 1881–1886 does not help in clarifying the publication date of the new Cary catalog. 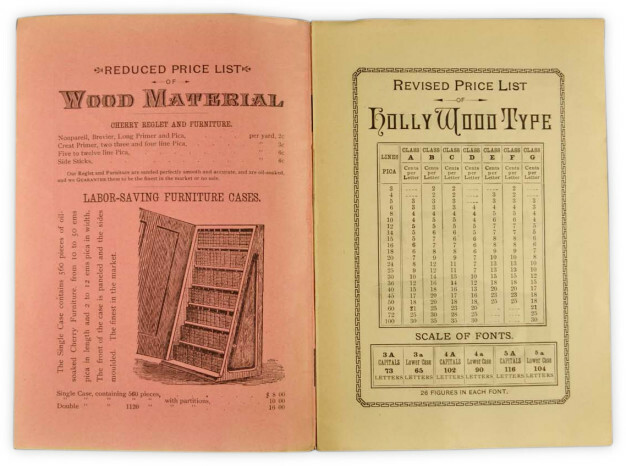 In the task of determining when the new Cary catalog was published, comparing the type size offerings between earlier and later catalogs was the only effective method that worked in this particular context. Fortunately it is definitive enough to help establish a reasonably accurate date range for the original date of publication. 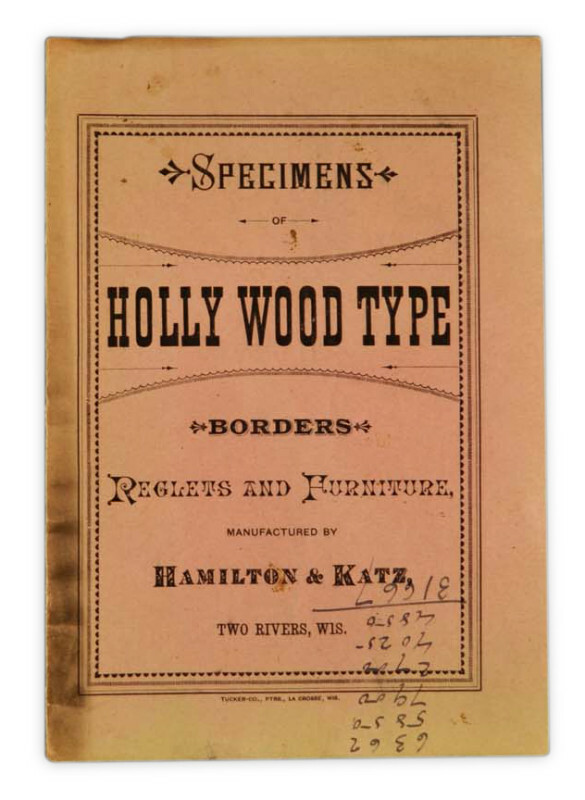 The Hamilton & Katz Specimens of Holly Wood Type, Borders, Reglets and Furniture was produced between late 1884 and mid 1885. It is a small 8 page pamphlet 5¼ × 7⅝″ with pink paper cover and cream paper interior. The pamphlet is printed in black ink throughout, saddle-stitched with light yellow thread. It is good condition with slight discoloration along the spine and handwritten numeration on the lower portion of the front cover. The catalog includes 10 type designs cut in Holly Wood veneer8 showing Antiques, French Clarendons and Gothics typical of the early 1880s. 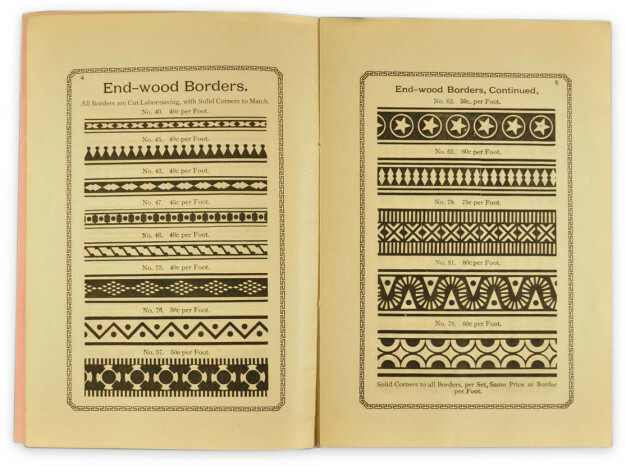 The catalog shows printed specimens in sizes ranging from 4-line to 30-line, as well as Combination Dashes, Stars, Indexes, solid and Star Rule and thirteen styles of End Wood Borders in a range of sizes. Special thanks to Amelia Hugill-Fontanel, Assistant Curator, RIT Cary Graphic Arts Collection, for acquisition information and permission to show images of the newly donated Hamilton & Katz catalog.